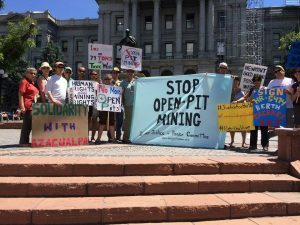 Today, July 22, many citizens of various countries around th e world took action to raise awareness of the serious social and environmental impacts posed by open pit mines on the Global Day of Action Against Open-Pit Mining. Mining companies destroy the living environment, monopolize the natural wealth that is essential for human communities, they transform farming and indigenous villages ways of subsistence. In Denver Members of the Denver Justice and Peace Committee, who oppose open-pit mines marched at the steps of the Capitol Building at noon to stand in solidarity with the people around the world living in close proximity to open- pit mines who suffer air and water pollution, whose lives are threatened by the criminalization of dissent. 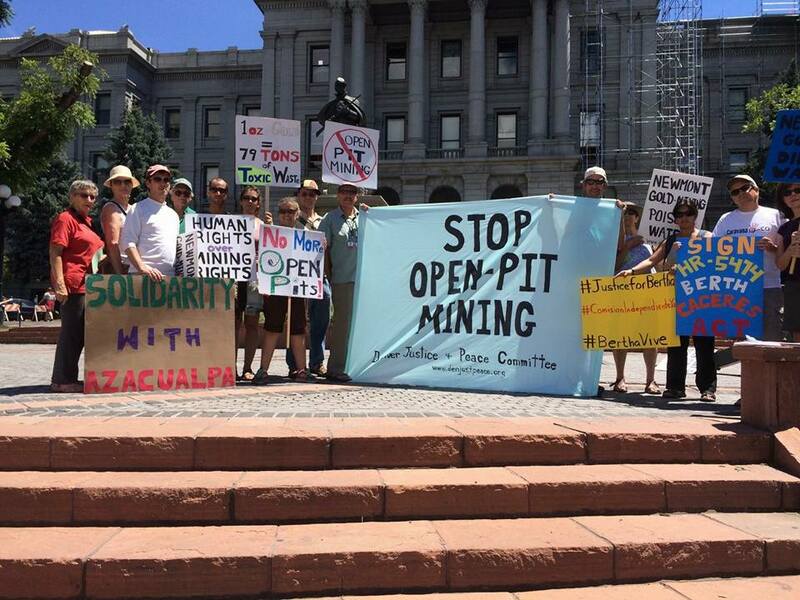 Mining is a big contributer to climate change and we have an open pit mine close to Denver. DJPC has advocated over years to stop the construction and expansion of open pit mines in Peru by Newmont Mining. Newmont, with headquarters in Denver, Colorado, has already been operating the Yanacocha Mine in Cajamarca, Peru, for the past two decades. It is the second largest gold mine in the world, and the largest mine in all of South America. Yanacocha operations have contaminated the region’s waters and annihilated lakes, creating an environment in which Peruvians have had to endure health battles, crop damage, and animal deaths. DJPC has stood in solidarity with the people of Celendin in Cajamarca, and Máxima Acuña de Chaupe the 2016 Goldman Environmental Prize winner. DJPC will continue to demand to stop the proposed expansion of Yanacocha, Conga, which is currently on hold but poses a threat as the newly elected president of Peru, Pedro Pablo Kuczynski, establishes new talks with representatives of Newmont to reinstate its operations in Celendin. Preventing the construction of open pit mines is imperative to stop further devastation to the communities’ precious water and land. No to mines! Yes to life! Conga no Va! Bambas no Va!